After entering the FBI-SOS website, students “travel” to their grade-specific island, which includes either seven or eight learning portals to visit. These areas address topics such as the protection of personal information, password strength, cell phone safety, social networking, and online gaming safety. The videos also include real-life stories of kids who have faced cyber bullies and online predators. Visit SOS. With school back in session, one topic that’s on many class curriculums around the nation is cyber safety. After all, it’s a hyper-connected world—with texting, social networking, e-mail, online gaming, chat, music downloading, web surfing, and other forms of wired and wireless communication now a regular part of children’s lives. The FBI has a new program that can help. Today, as part of its longstanding crime prevention and public outreach efforts, the FBI is announcing a free web-based initiative designed to help teachers educate students about cyber safety. It’s called the FBI-SOS (Safe Online Surfing) Internet Challenge—and it was developed with the assistance of the National Center for Missing & Exploited Children and with the input of teachers and schools. FBI-SOS is available through a newly revamped website at https://sos.fbi.gov. 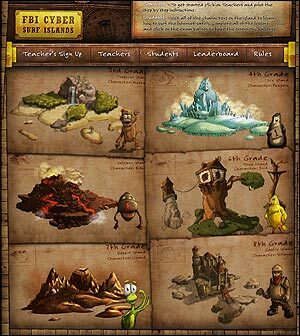 The site features six grade-specific “islands”—for third- through eighth-grade students—highlighting various aspects of cyber security through games, videos, and other interactive features. Each island has either seven or eight areas to explore—with a specific cyber safety lesson—and its own central character and visual theme. For example, fourth grade features Ice Island, complete with falling snow and penguins. To encourage participation and enhance learning, FBI-SOS includes both testing for students and competition among schools. Each grade level has its own exam, which can only be taken after teachers have signed up their respective classes and all activities on the island have been completed by each student. And once all the exams for a class are graded (done electronically by the FBI), schools appear on a leader board in three categories based on the number of total participants. During each rating period, top-scoring schools in each category nationwide are awarded an FBI-SOS trophy and, when possible, receive a visit from a local FBI agent. All public, private, and home schools are eligible to participate. Detailed rules and instructions for students.